FirstCry.com is India's big store for your cute little ones. FirstCry is Asia's largest online portal for kids and baby products. Tehy have oven 90000 plus products from 1200+ top international and Indian brands like Pigeon, Mattel, Funskool, Hotwheels, Nuby, Ben10, Pampers, Medela, Farlin, Disney, Barbie, Fisher Price, Gerber, Mee Mee and so on. FirstCry offers 2 amazing offers today as Sunday special offers for this longweekend of October 2015. How to avail this FirstCry Offer? 1. Visit Firstcry from here. 2. If you are a new user, register with Firstcry.com. If you are an existing user, login to FirstCry with your login credentials. 3. 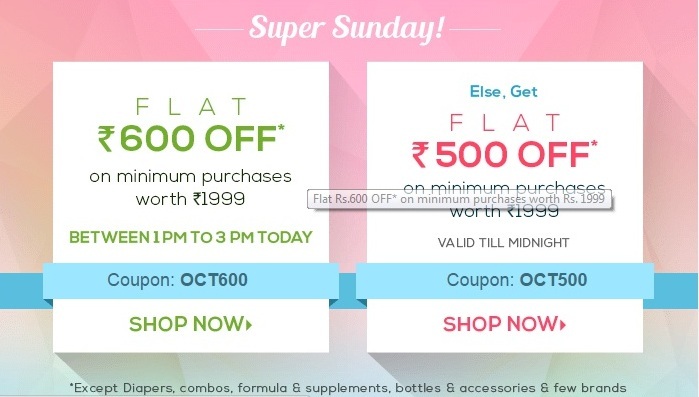 Add products worth a minimum value of Rs.1999 to the cart. 4. Apply Firstcry offer code - OCT600. 5. Buy with a flat discount of Rs.600 with this firstcry coupon code. 1. The order value should be minimum Rs.1999 to get a firstcry discount of Rs.600. 2. This Firstcry offer is valid only today from 1 PM to 3 PM. 3. You cannot apply this firstcry coupon code on Diapers, Combos, Bottles & Accessories and Formula & Supplements and brands Bata,Beatrix,Bodycare,Charlie Banana,Elefantastik,Fisher Price,Funskool,Graco,Johnson & Johnson,Kadam Baby,Learning Journey,Lego,Leap Frog,Liberty,Luvable Friends,MANI Jewel,Melissa & Doug,Mosti,Nino Bambino,Nintendo,O3 Kids,Prince Lionheart,Proteens,Protinex,Sony,Tidlo,Tupperware,Vicks,Wanna Party,Wudplay & X-Box. 4. Firstcry specific terms and conditions are applicable. 6. Coupon Code is applicable on MRP of Products. 4. Apply Firstcry offer code - OCT500. 5. Buy with a flat discount of Rs.500 with this firstcry coupon code. 1. The order value should be minimum Rs.1999 to get a firstcry discount of Rs.500. 2. This Firstcry offer is valid only till midnight today. 7. If you are buying items between 1 PM and 3 PM today, you can get additional Rs.100 discount by using the first firstcry promo code - OCT600.